Sheila Atim has been a part of hugely acclaimed productions which include the recent Shakespeare Trilogy at Donmar Warehouse and National Theatre’s Les Blancs. She is now on stage in the lead role in Babette’s Feast at The Printroom Notting Hill. 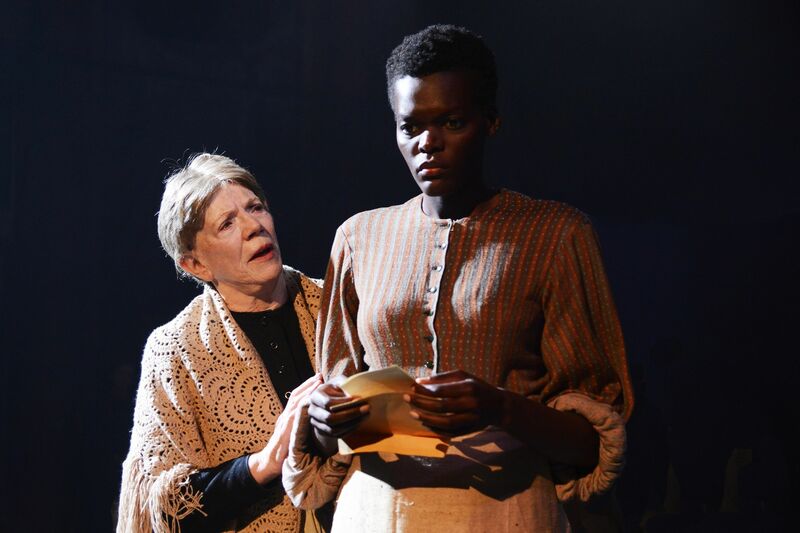 It is no surprise tickets are selling fast on this production, Sheila Atim leads a stellar cast that includes Diana Quick, Marjorie Yates, Joseph Marcell, Ladi Emeruwa,, Henry Everett, and Richard Clews. Babette’s Feast is brought to the stage by the creative team behind Tooting Arts Club’s hit production of Sweeney Todd. Atim plays the mysterious stranger who arrives in the remote Norwegian village desperate and exhausted, a refugee from revolutionary Paris. Taken in by sisters Martine and Philippa who live a simple life caring for their elderly neighbours. One day Babette wins money on a lottery ticket and offers to cook a supper for the community, the sisters reluctantly grant her wish. A heavenly banquet follows, decadent above and beyond what the villagers could ever imagine, stirring hearts “long-lost passions and joys”. A culinary delight, an unearthly feast, nothing else will be talked about in this little town for a very long time. Time passing is done smoothly handling the flashbacks well and Atim manages to sustain her elusive magical performance gliding through the play, weaving the story of decades of lost desires that is in the belly of the little yellow house in the village. The well orchestrated feast might leave you a little hungry. The original Babette’s Feast is a 1987 Danish drama film directed and written by Gabrial Axel based on the classic short story by Isak Dinesen (Karen Blixen). Produced by Just Betzer, Bo Christensen, and Benni Korzen with funding from the Danish Film Institute, Babette’s Feast was the first Danish cinema film of a Blixen story. The stage play is adapted by Glyn Maxwell. 1) Tell us about your character in Babette’s Feast? Babette is a French refugee during the time of the Paris Commune. Through an old friend, she ends up living with 2 sisters in Norway who lead a very different life to hers. She appears to be quite a mysterious figure but little do they know she has hidden talents. 2) What was your first professional acting job? My first professional job was at the Globe Theatre in London in a play called “The Lightning Child”, written by Che Walker and directed by Matthew Dunster. 3) Which do you prefer the stage or the screen and why? Most of the work I have done so far has been stage and it has been invaluable to me as part of my learning process. I love live performance and the rehearsal that goes with it. However, I would love to do more screen too, as there is a different skill-set to tap into and develop. It would be great to have the opportunity to work with different mediums. 4) What do you like about the role of Babette, and is there anything about this character that you can relate to as Sheila Atim? I like Babette’s complexity. Considering her situation, she does things in the play that people might consider unusual or reckless but when faced with extreme circumstances, things are never that simple. I definitely admire her ability to carry on, even in the face of everything and own her situation to the best of her ability. 5) How much has the adaption taken from the original novella by Karen Blixen? The adaptation has taken so many elements from original story. I think that was important to Bill Buckhurst (director) and Glyn Maxwell (writer). Blixen’s writing has a simple but magical quality – almost fairytale-like. And that is right at the centre of the story so it was important to conserve that. 6) What is it like gracing the stage with Joseph Marcell? It’s been great working with Joseph. He’s a lovely guy and a great actor. Of course, I grew up watching him on TV and so to be able to work with someone you admire and learn from them first-hand is an opportunity I was grateful to have. 7) Where were you born and did your parents encourage this journey? I was born in Uganda and moved here as a young baby, so all of my life has more or less been spent in London. I started off with much more academic aspirations and although my Mother was keen for me to continue on that path, she was also understood the importance of nurturing the artistic side too. So, when I decided to make the career shift, she was so supportive. 8) What professional training have you had? I went to WAC Arts an arts college while I was at university studying something different. The classes were great because they offered high quality training with professionals in their field but for a very low fee and every day of the week. 9)If you could play any role on stage or screen what would that be? I’d love to do a biopic, or something based on a real person from history. Someone provocative. Having the chance to dig into someone’s true story would be exciting. 10) And what advice do you give to the next generation of actors? I’d say keep active and involved. Keep finding new ways to challenge and stretch yourself.